I just want to point out the action in 10-year high-yield spreads. This is the rate that high-yield bonds are yielding above government treasuries. To me, credit spreads are all that matter. Stocks are simply backing up in sympathy with the widening of credit spreads. 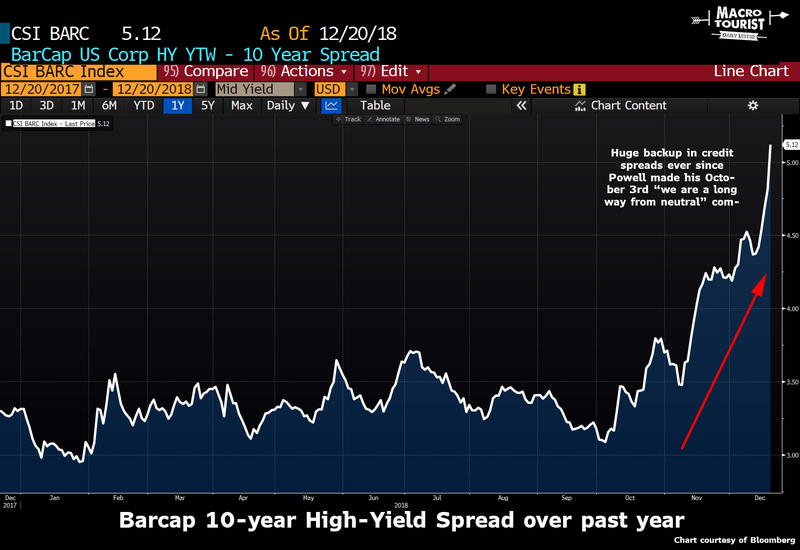 According to Bloomberg, yesterday was the biggest one day expansion in high-yield credit spreads since August 2011. That’s not good and it’s no wonder stocks are struggling. Yet, amidst all of this doomsday talk, it’s instructive to step back and look at the bigger picture. Have we been here before? And what was the outcome back then? Well, the past 3-month widening has been a touch more quick, but the move resembles 2014 to a surprising degree. 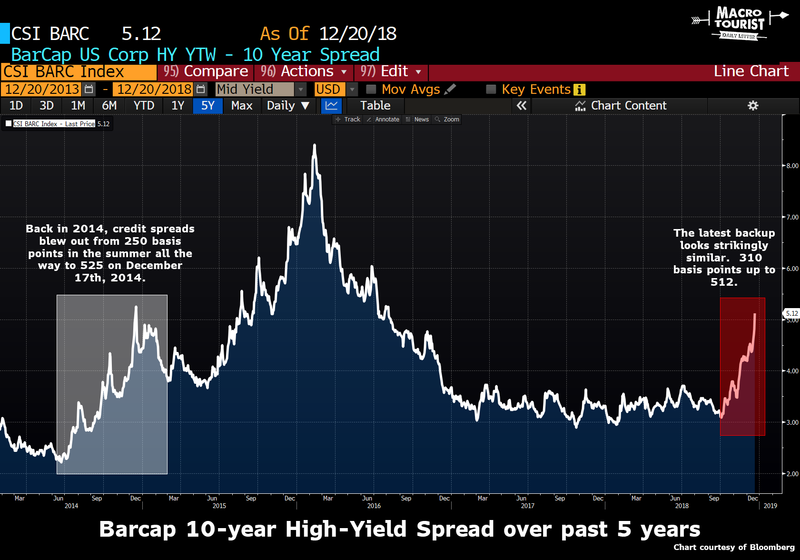 In 2014 the 10-year Barcap high-yield spread widened from 250 basis points all the way to 525 basis points in mid December. Interestingly, the high of the credit spread corresponded with the FOMC meeting - December 17th. During the past three months, the credit spread has moved a similar amount to the 2014 episode. The only difference is that this December 19th FOMC meeting didn’t prove the high, but instead only encouraged more selling of credit. Will it get worse from here? Will traders continue selling everything in a desperate attempt to get risk off the sheets for year end? Or have we reached that ‘obscene point’ where it makes sense to take out some blue tickets? Regardless of your view, keep your eye on credit spreads. It will be difficult for stocks to rally without this spread tightening back to more reasonable levels. At the very least we need the selling in credit to stop and for spreads to stabilize. I am a private investor who used to work for a big Canadian bank as a derivative index trader. I have been writing a journal for myself for many years. From time to time I have shared these posts with colleagues and friends on my site, The Macro Tourist. Many have encouraged me to write on a more regular basis and to allow others to read it. So, this journal is a response to these suggestions. This journal is simply a collection of my ideas and thoughts. 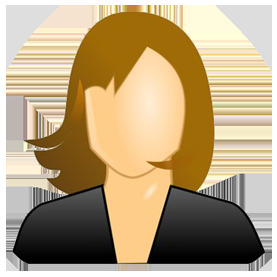 They are not recommendations to buy or sell any specific securities. You have to be responsbible for your own trades. For my colleagues in the investment industy who understand how trading works, this goes without saying, but for those that don’t do this for a living, I just want to make it clear that you need to make your own decisions. I fully expect a good percentage of my trades not to work. Dealing with these trades is what makes a good trader a great trader (and don’t bother asking me how to be a great trader either, as I am still trying to figure that part out as well). As you come to read my ideas and thoughts, you will realize that my style is almost the opposite of a trend follower. In fact, during a big move, I am often trying to catch the falling knives. It is a both a strength and weakness, and as of yet, I am unsure if the missing fingers are worth it. You might also notice that I rely on other investors for a fair amount of the nitty gritty detailed stock analysis. When it comes to balance sheet anaylsys, I am no David Einhorn or Prem Watsa, but when they are buying a security in a name that I have a bigger macro themed view on, I am not ashamed to simply ride their coat tails. However I am extremely picky about whose analysis I rely on. I don’t simply read Seeking Alpha or Citibank’s research report and climb aboard an idea. I need to respect and trust the person whose idea I am emulating. These great investors trade with their own timeframe and risk preference, therefore I only rely on them to point me in the right direction, not to tell me when to buy or sell. You might be asking yourself, well why bother reading me at all? The benefits that I offer can be best summed up by Michael Steindhart, who in classic book Market Wizards, described one of his friends this way – “There is a very good investor I speak to frequently who said, ‘All I bring to the party is twenty-eight years of mistakes.’” Although I haven’t been trading for 28 years, I am getting closer than I would like to admit and I have made way more mistakes than I would care to remember. This journal is a way for me to share those mistakes with you. The Macro Tourist Where Is Beeks?